Encasing the starting yarn tail: When working in a MC, I encase the starting yarn tail into the second round of stitching and cut it off after a few stitches. This neatly and securely hides it without having to weave it in at the end. 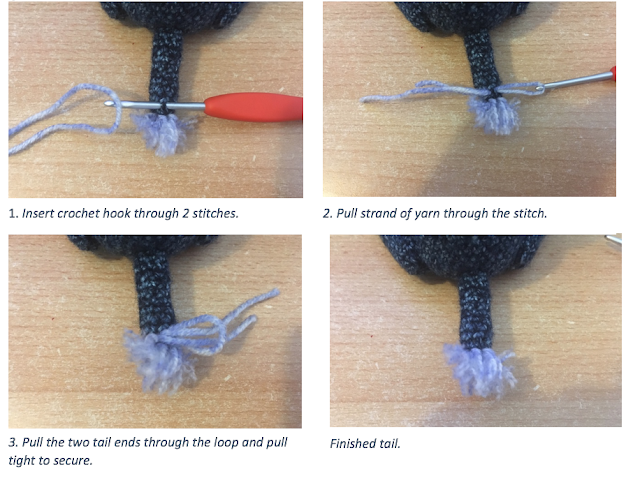 Finish Off (FO): Slst into the next stitch to secure the yarn and then cut the yarn free leaving a tail, leaving the hole open unless it says to close the hole. Closing the hole: For the neatest finish, I weave the yarn tail through the front loops only of the stitches in the last round going from centre outwards in all stitches. I do this loosely and then pull tight once I have gone through all stitches. Then hide the yarn tail into the body. Invisible decrease: This is done by going through the front loop only rather than both loops of the stitches you are decreasing. This gives a neater, tighter finish. You want to use this when crocheting in the round. I use a very long scrap piece of yarn as a stitch marker weaving it into place whilst not removing it from the previous round. I do this incase I make a mistake and then can easy get to the correct round and starting point. When I first started crochet I had real trouble getting my hook through the first stitch after pulling the loop tight. It maybe where I pull it very tight and crochet quite tightly too. To help this, before pulling the loop closed, I place a scrap piece of yarn, like you do with a stitch marker, through that first stitch I made (which will be the first stitch of the second round). I remove it once I am ready to crochet into that stitch. If you have issues with filling coming through when closing up the hole in amigurumi, it can help to place a bit of felt over the filling in the hole. To avoid clumps in amigurumi, break the filling into smaller pieces and stuff little by little. It is a little more time consuming but gives a smoother and more even filling. These pieces are joined together using a whipstitch unless otherwise stated. 1. Pin the two pieces together to insure the pieces stay in place. Thread the yarn tail of the limb through the needle. 2. Insert the needle through the hole the yarn tail is coming out of and go through the leg and body. 3. Insert the needle through the same hole in the body you just came out of slant the needle so that it goes through a different hole the body and leg where the join is. Repeat this until the limb is securely sewn. Going in and out of the same stitch on the pieces that are showing insures that you do not get dimples in the pieces. I use DK acrylic yarn for my amigurumi. The brand is Hayfield. I like this yarn because I can get it from a craft shop near by, it comes in a wide range of colours and is washable. I am English and I call it yarn. I often get picked up on that as apparently 'yarn' is more of an American term. It is just a term I have learnt to use before I even started crocheting. Wool is made from sheep and is expensive, it is a type of yarn. Yarn is just a more general term I guess. You can call it wool or yarn, we all know what you mean. I tend to use 3mm hook for most of my projects. The yarn I use will generally tell me to use a 4mm but I prefer the tighter finish that the 3mm gives me. I have a set of hooks that are different sizes and have comfort handles. Fur stitch/loop stitch - Insert hook into stitch, wrap a loop of yarn around the finger that is holding the working yarn, yo and pull through leaving that loop on your finger. 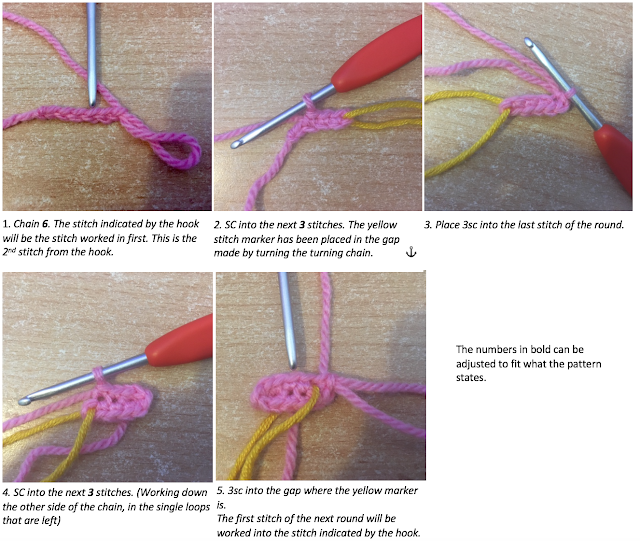 Complete the sc by yarning over and pulling through the 2 loops on the hook as normal. Should have mentioned before. Great amigurumi patterns too. Looking forward to trying them out. Thanks for putting these out there. Always on the look out for a new pattern! My profile picture is my gorgeous cat. He is rather funny looking bless him! Understuffing isn't good. But then it is harder to not pull through the stuffing when sewing on pieces if it is well stuffed. I have done the same as you! Thought things were stuffed enough and then realised when closing that they are. I use a orange stick to then carefully poke stuffing in. Takes ages but is worth it. I bet she loved receiving your swap! I would have been over the moon if I got that. How tall is the finished product? Which item would you like the measurements for? Hi. Where the ear is worked in rows rather than rounds, the difference in them is not as obvious. You could however reverse rows 3 and 5 (just do them backwards) and you should get matching. Hi Amy. We have an alpaca farm and am working on your sweet alpaca amigurumi pattern. A little puzzled with body line 5 - joining the legs to body.When joining leg, I crochet around the top of leg and move to next - inc. - join 2nd leg etc. When I do the math, I am a few sts (9) shy of the 72. This is the most tricky round and can take a few times to get right. It might be helpful to mark the 2 stitches for all four leg joins as it is easy to skip over these by mistake. Each 'join leg' makes a total of 12 stitches. 2 that are through the leg and body piece and the other 10 that are just through the leg. Thank you so much Amy. I just completed row 7. I have a couple of extra sts in the count but can fix that. My next one will be better. I plan on putting my finished alpaca on my facebook (HighTales Alpaca Farm) and would like to mention your name as designer, if that is alright with you. If not, no problem. I am so pleased to have this pattern and hope my little fellow turns out as cute as yours. Of course I am using our own alpaca yarn....all natural. Thank you so much. I myself have found that round tricky at times but it has the best look. I made one using alpaca yarn recently and it is so soft and just love the idea. Yes please tag me in it on facebook. Would love to see it. Gladly. Thank you so much. I am so enjoying the pattern. I am up to the 16a and 15b rounds..another challenge for me. I have low vision so I have to study things well. Hi Amy. I just finished my little alpaca. a photo is on my facebook with your name credited for the pattern. You can check him out if you like. I don't know how to tag your name so this is the best i can do. thank you so much. How tall is this with the size 3.0 hook?